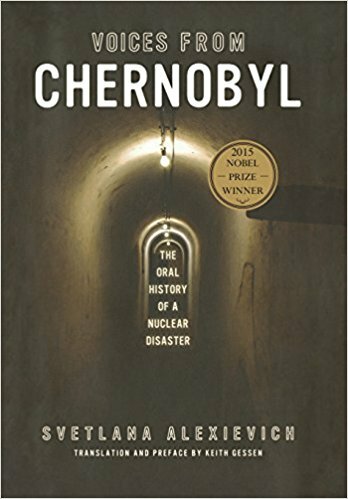 This book is an oral history of the nuclear reactor accident at Chernobyl in 1986, and of the suffering, death, and contamination—biological, environmental, psychological, existential—left in its wake. It is constructed from the testimony of dozens of people whose lives were transformed by the disaster: plant workers and first responders and their families; members of the clean-up brigades and service providers who coped with the unprecedented scope and severity of the radiation; former inhabitants of the land within thirty kilometers of the power plant that, after evacuation, would come to be designated as the Zone of Exclusion. The distillation of Svetlana Alexievich’s interviews with Lyudmilla Ignatenko, the wife of a deceased fireman, and the scores of other people represented in the pages that follow—Alexievich gives herself no voice in the book, except in the epilogue—is an intense feat of strange and harrowing eloquence. It’s not writing, exactly, but a kind of expressive listening that is made more resonant by each monologue’s setting within a polyphonic sequence. With an imaginative reach Tolstoy might admire, Alexievich assembles evidence voice by voice in the service not of realism, but of the deeper human realities that both history and realism all too often mask.